Pangu jailbreak for iOS 7.1.X released last week to everyone’s surprise by a mysterious team of Chinese jailbreak developers. It was however only available for Windows, and the entire interface was in Chinese. The Pangu team today updated their jailbreak tool to v7.1, adding a Mac version, and English support. This post gives you step-by-step instructions to jailbreak your iOS device with Pangu for Mac. Please note Pangu is an untethered jailbreak for iOS 7.1 and iOS 7.1.1. Please disable the passcode as the jailbreak may fail, if the passcode is enabled (Settings -> General -> Passcode Lock On -> Turn Passcode Off). Take a backup of your device using iTunes before proceeding. Step 1: Download the latest version of Pangu jailbreak for Mac from the Pangu website. Step 4: Doble click on the Pangu_v7.1.dmg file you just downloaded to mount it. 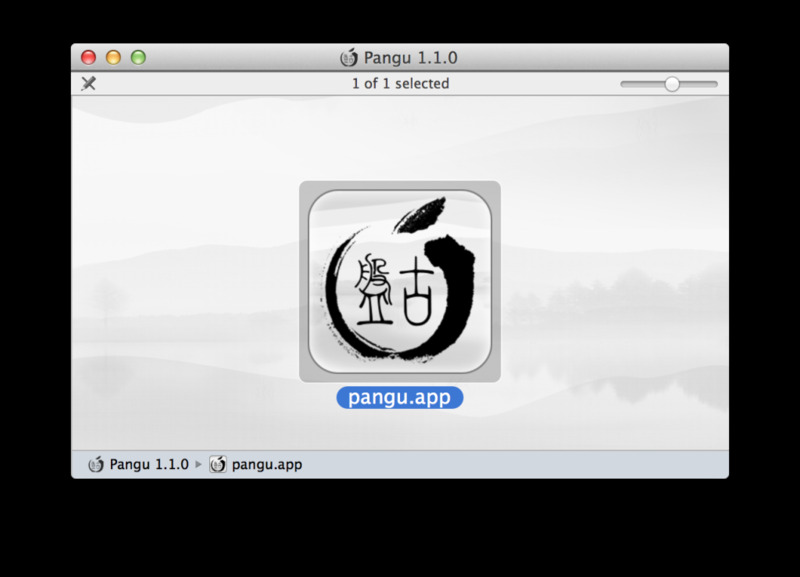 Step 5: You should now see a new window with a Pangu.app icon. Step 7: Follow the on-screen instructions. Step 8: Pangu should restart the process and install the Pangu app on your iOS device. Step 9: Tap on the Pangu app on the Home screen of your device to continue with the jailbreak process. Step 10: Wait for your device to reboot several times. After a few minutes you should see that you have Cydia on your home screen and you’ll be ready to start installing tweaks on iOS 7.1.x.